On Sept 11, 2001, 19 men hijacked planes and used them to kill over 3,000 people. They represented a group calling themselves al-Qaeda. They were terrorists who used a religion to justify their hate. For sixteen years, presidents and the whole of America’s political leadership were clear that we did not blame all Muslims for the actions of a fringe conspiracy that cloaked itself with a holy scripture. Our President at the time, George Bush, said that this group had hijacked a great religion. A religion of peace. For sixteen years, eight years of a Republican president, eight years of a Democratic president, America followed a course of pursuing terrorists and also deepening ties with ALL countries for allies in this fight. This is not romanticized naïveté. It is basic logic that if we wanted to pursue and defeat the Taliban in Afghanistan, for example, that we had to work with the Afghani people. This is not mushy heads and bleeding hearts. This is a bipartisan, pragmatic policy that sought to make America safe at home and Americans safe around the world. Our fight is not with Islam. That kind of reductive thinking is what the terrorists do. They attack civilians because they see all of Europe and all of the Western world as their enemy, no matter how young, no matter how old. We cannot react impulsively by attacking anyone who has the faith the terrorists CLAIM to have. That is what the terrorists want, to draw us in, to tie us down in a quagmire that will deplete our resources, sap our will and force us to leave behind our principles, our morals, to abandon our Constitution, our Bill of Rights. They want to see us brought into a controversial and deceptively simple campaign. In 2008, a woman at a town hall said she was afraid of Sen. Barack Obama because he was a Muslim. The Republican nominee, his fellow Senator, John McCain, said, “No.” He rejected the ugly smear campaign publicly, unequivocally. That was the bipartisan message. A message of leadership. Leadership that rejected whatever political points could be gained. Leadership that would not pander to prejudice. Then, in 2016, we heard people claiming that thousands of Muslims were dancing in the streets on Sept 11 in NJ. More lies. More trash. Today’s gospel reading (Luke 6) shows us how some people use religion to catch people making mistakes. Some people use religion to punish and expel. God’s rules are not for keeping people out. God’s commandments are not for excluding people, not creating a privileged priesthood or a holy caste. In today’s gospel we hear how the Sabbath law can be used to judge and condemn. The Sabbath laws were not for excluding people. They were just the opposite. The Sabbath commandment says, if anyone gets a day off, everyone gets a day off, even aliens, slaves and animals. “…In our love for you, our Muslim neighbors, we are distressed by the ways in which you are being forced to bear the fears held by many in our nation. Therefore, we renew our commitment to find even more effective ways to protect and defend you from words and actions that assault your safety and well being. Today’s gospel, today’s good news, could not have been more timely. Indeed the core of the gospel message is concern for those excluded, those treated as something less. Jesus came to proclaim good news for the poor, release to the captives. He spoke for those who were excluded. He lived as one who was among those who were kept down and was executed for speaking about another way. 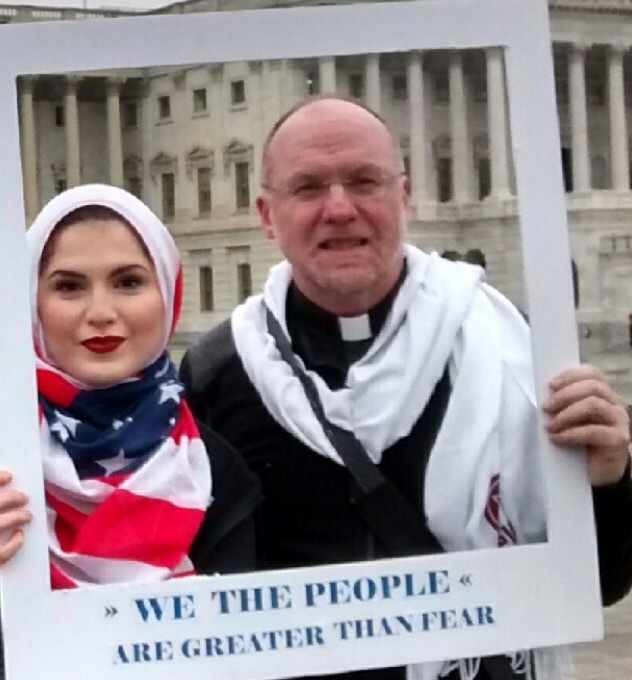 Our Lutheran-Muslim relations have taken two forms in recent months: rapid response to anti-Muslim bigotry and continued engagement in long- term relationship-building, education, dialogue, and cooperation for the common good. We are working in partnership with the Islamic Society of North America on church-mosque pilot projects in three synods: Southeastern Pennsylvania, Southwestern Washington, and Southeast Michigan. Thanks to Bishop Donald Kreiss, Bishop Rick Jaech, and Bishop Clarie Burkat for leading. The hope is that by taking these steps and expanding out to include other existing and new initiatives across this church, we will build out stronger local relations across the country. We are also partnering with the Shoulder to Shoulder Campaign to respond to increased incidents of anti-Muslim bigotry over the past year and to concerns about anti-Muslim policies, including the recent and anticipated executive orders. Shoulder to Shoulder is a coalition of 34 religious denominations and organizations committed to standing with American Muslims to uphold American values. We have participated in statements, press conference, events and strategic planning sessions. February 6 clergy letter on Executive Order halting Refugees.